Every little girl should have an American Girl doll! The characters tell a story and can easily be chosen to fit your little girls favorite hobbies or taste. 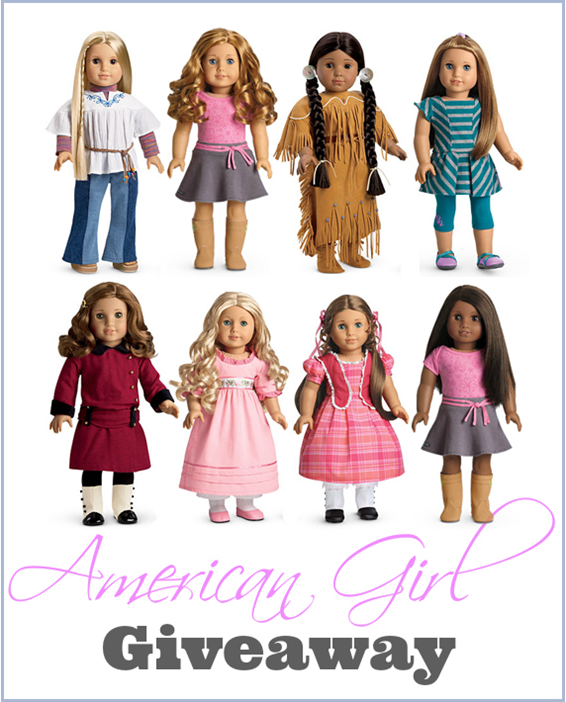 We are offering an American Girl giveaway to one lucky winner. Enter to win below and that special little girl in your life will be beaming with joy! Organized by: Mom Powered Media. Giveaway ends March 6th at 11:59pm, open to US and Canadia residents, ages 18+. To enter please use the Rafflecopter form below. Good luck. I would pick the Rebecca doll!!! My daughter would love Kaya! Thanks for the chance! I would like the American Girl Kit Kittredge doll. I’d like the My American Girls with the light skin, brown hair and brown eyes! I love Isabelle. As a child I had Molly, and I would love for my daughter to have her very own doll! I would like Isabelle or Kit. I would either choose Kaya or Julie. Kaya would be selected for our American Indian heritage,, and is my favorite, but Julie is very similar (both in appearance and style) to my daughter, Tia. Tia and her sister each had an American Girl doll as well as a Bitty Baby, but they were destroyed when a storm damaged our home. Marie Grace or Caroline, can’t decide! My daughter would love Rebecca! Thank you sooooooo much for this, my daughter would love Caroline! I would love to win either Kayla or Julie, for my daughters! Thank you for the chance to win. My niece would love one. I. HAVE Two Twin GrandDaughters. They would love one!!!! I would choose either Isabelle or Julie. I would have to go with Addy!!!! She is so pretty and my daughter would love her!!! I would choose Caroline Abbott. I would choose the Isabelle Doll. I think my daughter would like Caroline. Thank you!! I would choose Isabelle girl of the year. If I ever could afford it, I would have a doll created to look like my granddaughter which be much fun for her. They are all beautiful dolls. I think my granddaughter would love Caroline. Thanks for this contest.